It says "The Doubles King" in a few places on this storefront, and they receive absolutely zero arguments from me in using such a royal moniker. 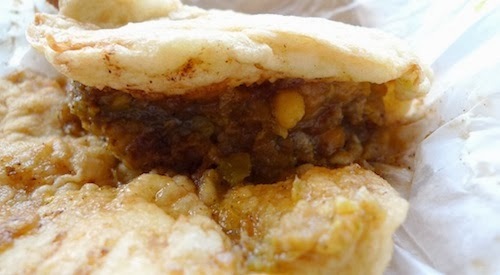 From Bedford-Stuyvesant through Crown Heights and down to Prospect Lefferts Gardens it is not hard to find yourself a good bake or doubles, but the best places are most easily detected by their lines out the door. On a weekend late morning you might be enjoying a queue of 20-30 minutes with other hungry souls, but at anytime of day these doubles ($1.25 each) are worth the wait. Really it should not be photographed because without tasting you might be turned off by the look. But these flatbread delicacies are delicious, a flavorful curry combined with sharp tamarind sauce and spice. Three is most certainly enough for a filling lunch, making this an economic dream. A printed sign describes their urgent and apologetic need to raise the price a full quarter higher from the old $1. 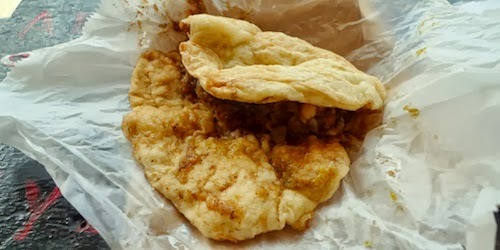 They also have all the rest of the stuff you normally find in a Trini bakery, aloo pies, bus-up-shuts, and of course bakes, which are actually sandwiches with various choices of ingredients. You cannot go wrong with a bake n' shark. The service here is quick and frank, but don't be put off by this, they just need to keep the line moving. And don't forget that "doubles" is singular AND plural, so even if you just get one, it is still a doubles!